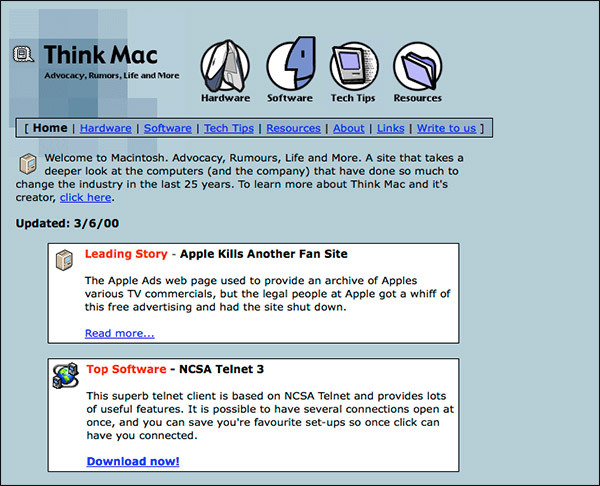 As you may notice, I’ve completely redesigned the ThinkMac website. Since I originally created the site for a student project 14 (!!) years ago it’s been hosted as static files. I feel it’s now long out grown this and it was time to switch over to a content management system. I’ve been really pleased with WordPress, which powered the old ThinkMac blog and my other business site Light Priority, so it made sense to use it here too. I’m using a customised version of the Business theme by Organic Themes with several plugins including Meta Slider, JetPack, Contact Form 7 and others. As WordPress performs very poorly on MediaTemple’s Grid service I’ve also moved hosting providers to TSO Host in the UK. This marks the fifth migration this website has made since its inception. Hopefully it’s not something I’ll have to do again anytime soon! ThinkMac’s website back in June 2000, grammatical errors abound! iKanji now on the Mac App Store! Well what do you know, iKanji has finally been approved for sale on the Mac App Store just 12 hours later than I released the direct sale version. So if you like you can now buy it from Apple. Before you do though, please remember we make a lot more per-sale when you buy direct and we can offer you updates faster as they don’t have to go through Apple’s lengthy review process. You also don’t have to worry about some arbitrary App Store rule change effecting the functionality we can offer in the future. I’ve redesigned iKanji to be a lot more like its iPhone sibling. 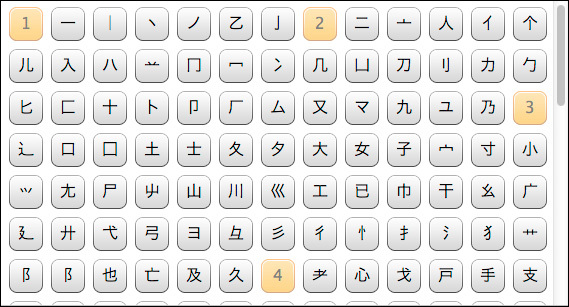 Kanji sets are now in a list and are subdivided into groups of 20. You can have multiple practice sets and I’m working on making syncing possible with iKanji touch. For now you can import and export your sets to share between computers, although you’ll have to do it sneakernet style. Kanji can be viewed as a list or as a bunch of tiny flash cards although gone is the cork texture and faux paper from earlier versions. Search has been improved quite a lot. You can now perform multi-radical searches and search for more specific sets of kanji attributes including grades, stroke counts and so on. It’s very useful to be able to search by radical parts for identifying unfamiliar kanji. 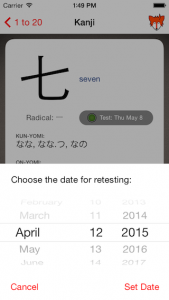 iKanji 2 introduces the spaced repetition training system from iKanji touch. The SRS system will guide you through learning kanji readings and meanings. Testing stroke order on a desktop or laptop is hard because nobody wants to try writing kanji using a mouse or trackpad and you lose the 1:1 physical connection and muscle memory you employ when you’re writing on paper. 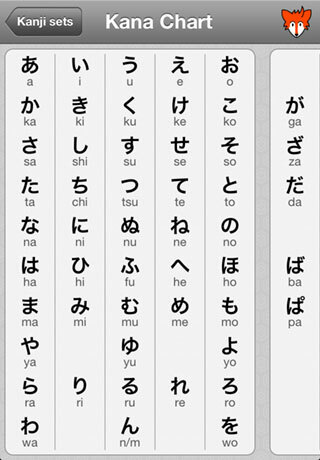 So for now I’m leaving stroke order out – it makes sense on the iPhone and iPad so please use these devices to practice writing Japanese instead. Following in iKana 2’s footsteps, iKanji now includes vocabulary training. Learning kanji in isolation is hard so I think this is a super important and useful feature for Japanese learners. Using the same spaced repetition system as kanji training, you can now learn thousands of words which will help you put kanji into context. 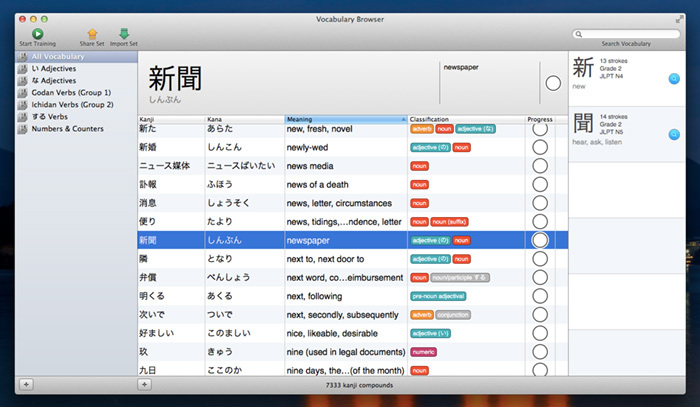 The vocab browser also gives you a breakdown of the meaning for each kanji in a word. I find this absolutely fascinating and hope you do too. For example for “了解” you can see the two kanji mean “complete, finish” and “untie, unravel”. Can you guess the meaning of the word? It’s “comprehension”, i.e. once you’ve completely unraveled something you comprehend it. There are lots of other little tweaks, fixes and changes too that will make using iKanji 2 a nicer experience but instead of me waffling on about them I recommend just downloading the app and trying it for yourself. iKanji 2 will run for 10 minutes at a time in trial mode so you can try all the features out before deciding if you’d like to purchase. It will be available on the Mac App Store in the next week or two hopefully, if you prefer to buy from there. iKanji requires OS X 10.7 (Lion) or later and is developer ID signed for Gatekeeper. This is a paid update for all customers unless you’ve purchased iKanji 1.5 recently. Specifically we’re offering free upgrades to customers who purchased iKanji on or after September 2012. Just get in touch if you qualify and we’ll send you a free iKanji 2 license. iKanji touch 1.7 – whats new? If you ever find yourself stumped looking kanji readings trying to remember if that’s a tsu or a shi or perhaps a re or a ne, the kana chart may come in handy. With a full alphabetical listing of all the hiragana and katakana characters with romaji. Have you ever wanted to just practice writing a kanji over and over until it sinks in? The Kanji Writing Practice feature offers just that. Watch the on-screen stroke animation or just work from memory. If you find it a little tricky using your finger to write the more complex kanji then a stylus, such as the Wacom Bamboo Stylus, works great. The first seven writing squares offer a guide to trace, after that you’ll need to draw it from scratch. 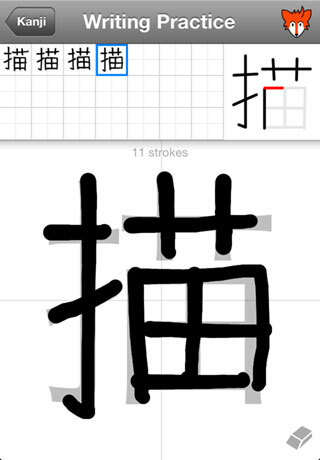 iKanji touch automatically progresses you to the next square after you’ve drawn the correct number of strokes. You can also tap any of the squares to view what you’ve previously drawn. If you enjoy writing kanji on your iPhone please have a look at iKana Nōto for the iPad which takes the concept to the next level. A common complaint I hear from users is that the writing test is too unforgiving. If you’re training while commuting and hit a bump which makes you miss a stroke then you lose all your training progress for the kanji, which isn’t much fun. In version 1.7, iKanji touch now lets you make two mistakes before marking an answer as wrong. Hopefully this is a fair balance between making things too easy and forgiving accidental input. I’ve also increased the size of the touch zones accepted so your chances of missing them is reduced. iKanji touch finally has stroke animations for all jōyō kanji including the 196 new kanji introduced in 2010! It’s taken a long time to get all the animations done but I’m happy to finally be able to offer such a complete set. There are still some missing for the more obscure kanji in the JLPT sets (mostly name kanji) but I hope to have those finished next year. BLEEP! It can be embarrassing if your phone makes a loud noise while you’re using iKanji touch. However you might not want to silence your phone or turn the ringer volume right down. Version 1.7 adds a volume control to the setting screen so you can make the sound effects as quiet or loud as you like. I’ve made some further improvements to VoiceOver support for browsing kanji. Unfortunately the Japanese voice quality on iOS is pretty poor compared to English, but it’s still better than nothing.